Doing business in a smart fashion is all about being creative. Without creativity, marketing your business can turn dramatic and fruitless. Installing an attractive sign is one of the smartest ways of promoting your products or services. Business signs play a vital role in driving prospective customers to your commercial establishment making them more significant than most people imagine. What can an attractive sign do for your business? Growing a successful business means being more competitive than your rivals. With every other business doing their best to demand a share of the market, it is up to you to think out of the box. An attractive sign is not only a smart but perfect way of attracting more business to your commercial establishment. All you need to do is to ensure that it’s informative, creative and eye-catching. An awesome, attractive and easily visible sign can attract more customers than you think. Remember, about 43% of those who relocate get attracted to new businesses as a result of attractive signage they come across. Additionally, 36% of prospective customers discover of a commercial establishment’s existence based on signage. Make your commercial sign attractive, noticeable and informative to experience increased business. Customers need to know where to find you in order to buy your products. Although some people overlook the essence of having an attractive commercial signage, it offers plenty of valuable information about your business in a matter of seconds. The main purpose of business signage is to signal locations. A good sign will not only make a positive impression about you but direct potential customers where to find your company, business hours, what you sell, prices and much more. For a more effective business signage, it is wise to hire a reputable commercial signage professional. Building a solid brand name can ensure that you remain at the top of the game for a very long time. Every business owner dreams of creating a good reputation for their brand through marketing. Nevertheless, not everyone gets the marketing part right. Installing a large, visible and attractive sign can easily transform your small business into a reputable brand. Apart from bringing in more customers, a well-customized sign will increase your brand visibility and awareness effectively without costing a substantial amount of money. Additionally, an attractive sign gives you more value for your money as compared to other forms of marketing such as radio/TV and printing advertising. All it takes for a business sign to be impressive is to make it more appealing and ensure it transmits the correct message. Are you considering installing an attractive business sign? 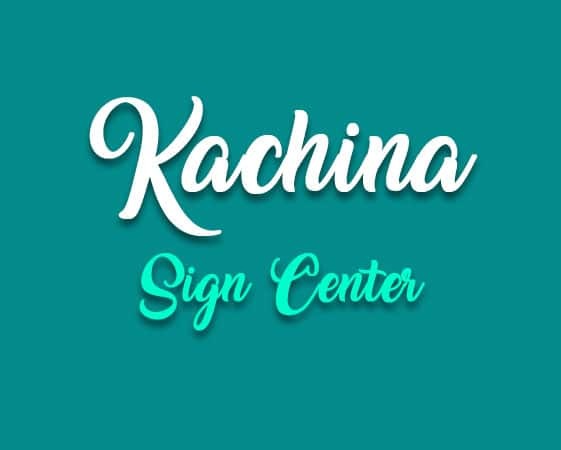 Contact Kachina Sign Center if you need professional signage assistance.